We caught up with one of Britain’s most exciting new directing talents to talk murderous babies and all things horror, as her debut slasher Prevenge takes its UK bow. You might remember that we were rather partial to Alice Lowe’s totally bonkers black comedy back in October when it premiered at the London Film Festival, and our opinion definitely hasn’t changed since. It’s easily one of the boldest and most imaginative British films of the year. So obviously we couldn’t quite settle without talking to the woman herself about it. Below you’ll find a whole bunch of questions ranging from thoughts on violence, to horror, to whether or not we’ll ever see any more of Channel 4’s iconic cult series Garth Marenghi’s Darkplace. Yep, we really dug deep. Prevenge is such an incredible title and such a unique idea – how the hell did it come about? Did you conceive the idea before you became pregnant? So you have a movie about a homicidal pregnant woman whose unborn foetus tells her to kill people, was it difficult to get it off the ground financially? Considering that it’s no secret that it’s especially difficult for female filmmakers in the industry too, did that play a part at all? “Well I had had an offer to make a low budget, micro shoot feature. Privately financed. No strings attached. In fact that was what attracted me to the project. Fast and without too much interference from several cooks spoiling the broth! 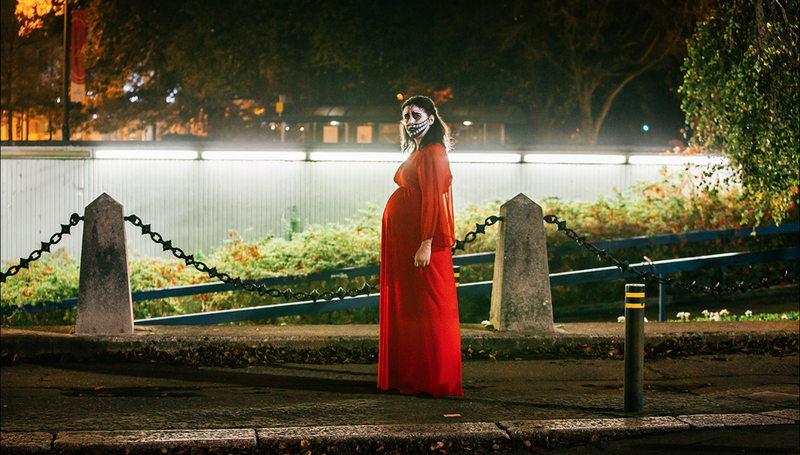 What struck me about Prevenge more specifically is that it’s a lot deeper than the black comedy/slasher audiences might first expect; you quite often dig down into the prejudices that befall pregnant women in general, and there’s some incredibly dark meditations on grief too. What made you head down this more grounded/emotional route? “I just wanted to evolve a bit. It’s a hugely personal project for me. Much more personal than I usually go. Although all of my characters are probably born of a deep dark side of myself. But I just think the more you put of yourself you put in a project, the more dangerous it is and therefore the most interesting. I was at FrightFest 2016 in London where you were talking up the movie, and you mentioned to Paul McEvoy that the most recent edit at that stage had gotten even darker than one he had seen before, was it ever on the cards to make a more straight-forward black comedy? “Not for me! But I think there was a point where the production company may have thought, “ah, it’s not a straight a comedy as we thought we were getting.” And maybe that meant wondering if it was going to be an easy sell. For me, it’s about never underestimating the audience. I think there’s a real appetite for the fresh and the new. And there to be some sincerity to a project. On a similar note, the violence in the film is brutal and grisly, with a very real feel to a lot of it; was there ever a time when you considered going more over the top with the blood and gore? What made you lean more towards realism? “I think probably for people who have experienced horrible events, the reality is probably horribly banal and it must feel very surreal and absurd almost. When you’re splashing too much gore around I think it starts to become cartoonish and perhaps even less morally responsible in some way? You’ve shown before in a lot of your other projects just how thin the line between horror and comedy really is – as a performer that’s come from quite a comedy lead background, what attracted you to the darkness of horror? Your written and directorial voice feels so incredibly British – is that where a lot of your influences come from? Could you ever see yourself taking a project over to Hollywood? “I could because the money is good, and you can get proper budgets! Also, I think there’s a kind of equality there for writers/directors which is quite refreshing. It’s like “we need content and you’re a writer and so therefore we need you”. Do you have any tips for first-time writer/directors or performers who want to break into the industry and get their film made? Finally, had to ask, are we ever likely to see any more of Garth Marenghi’s Darkplace? Would you be open to doing more? It’s such a killer idea, with such an incredible cult following! Prevenge is currently screening around the UK on various dates, and is set for wider release on 10th February. More info about where it’s showing can be found at prevengemovie.com.